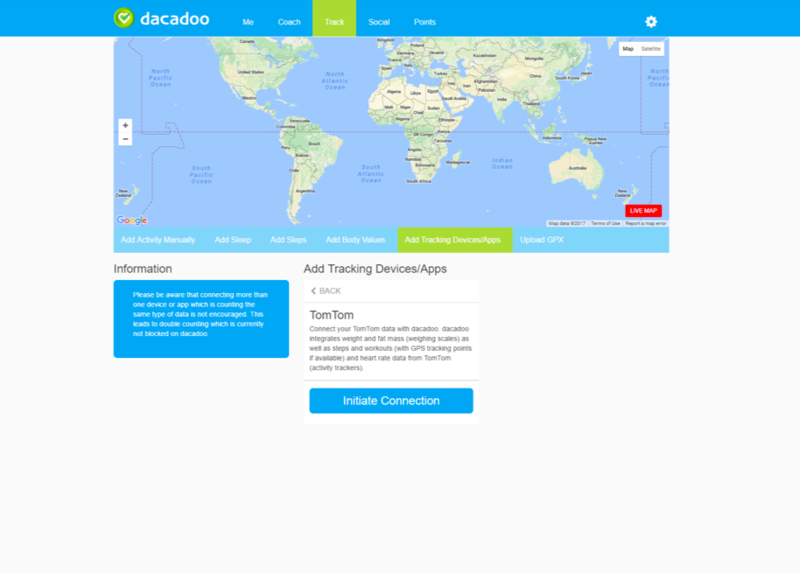 You can connect your TomTom device with dacadoo directly via the dacadoo mobile app (iOs, Android) or via the web access on www.dacadoo.com for PCs, tablets or other smartphones (e.g. Windows Phone, Blackberry, etc.). 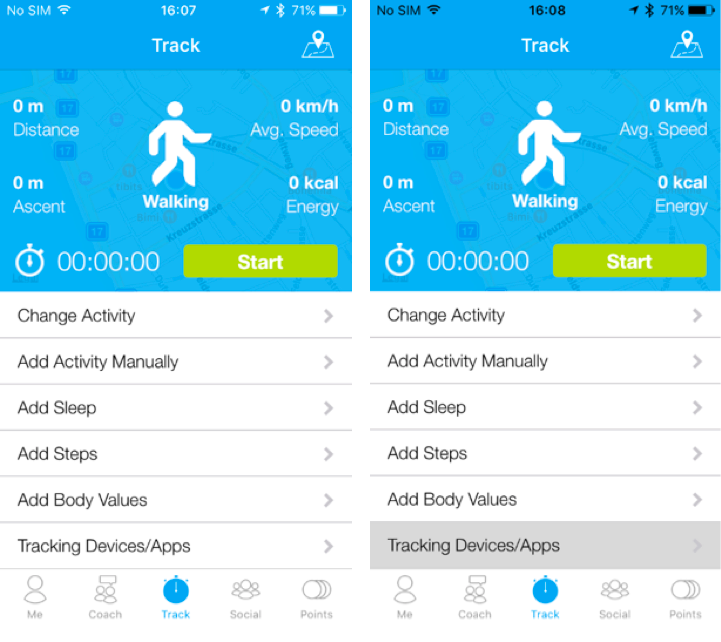 1) Open your dacadoo app and click on Track in the main navigation menu. Then click on Tracking Devices/Apps. 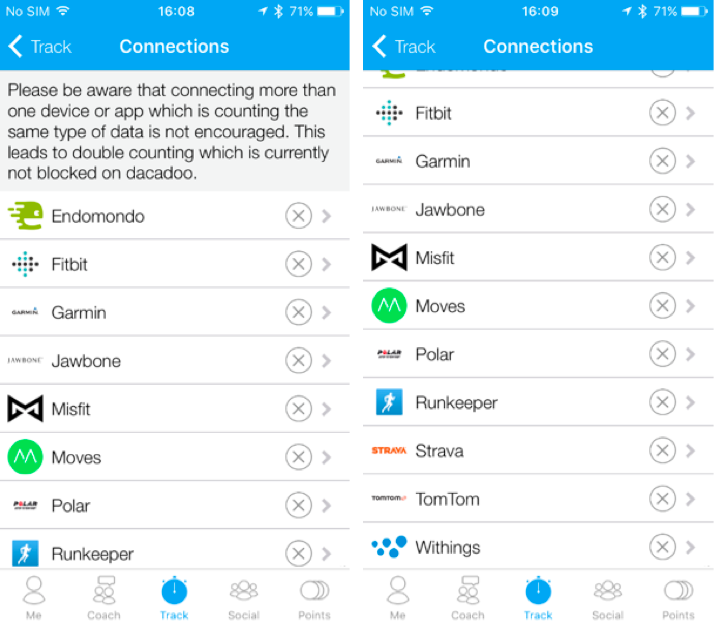 2) You will get to the overview of supported devices and apps by dacadoo. 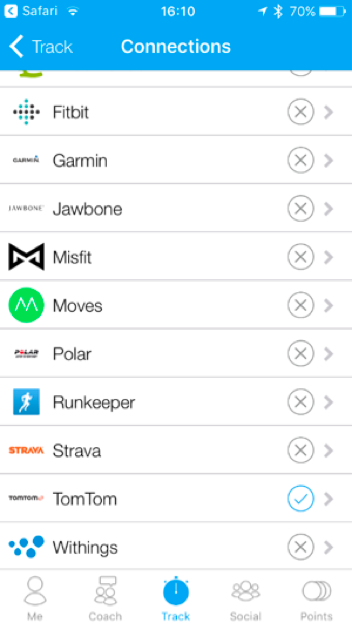 Select TomTom in the list of supported devices and apps. 3) The TomTom detail page will open. Click on Initialize Connection to start the connection process. 4) The TomTom authorization page will automatically open in the browser. 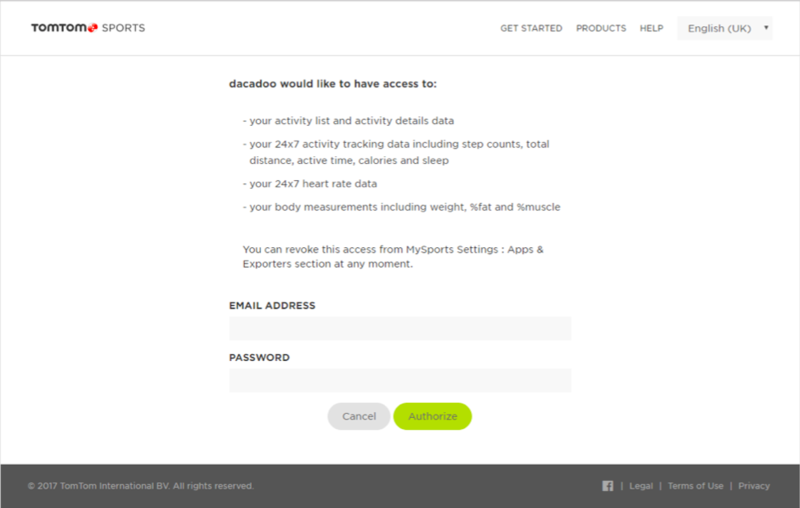 Enter the email address and password you are using for your TomTom MySports account. 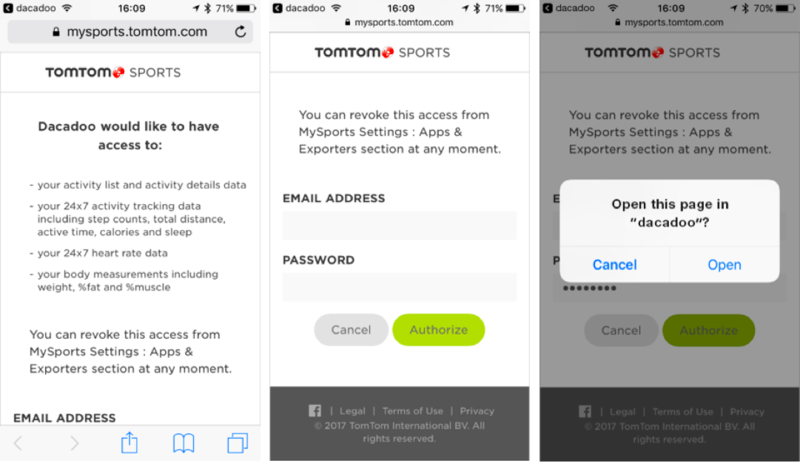 Then click on the button Authorize to allow the data transfer from TomTom MySports to dacadoo. 5) You will be redirected to the dacadoo mobile app, where you can select which data you want to transfer from TomTom to dacadoo. Once you have chosen which data you want to transfer, click on Save settings. 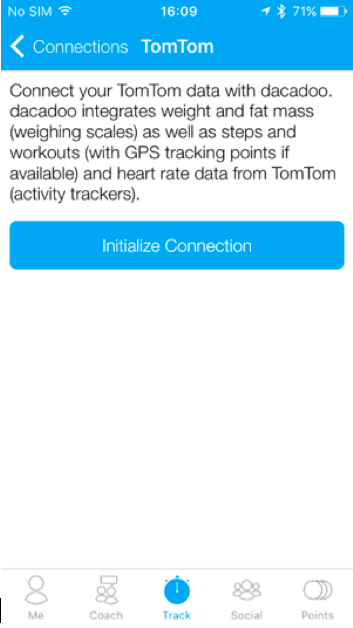 6) To double check if the connection of TomTom with dacadoo has been successfully established, please return to Track > Tracking Devices/Apps on dacadoo and verify if there is a blue tick next to TomTom. If yes, your connection has been successfully established. 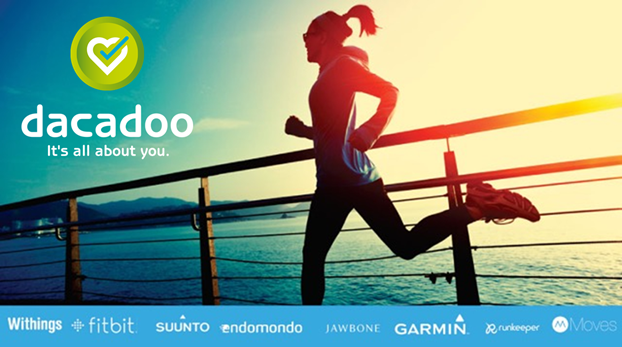 Please note that the activities tracked with TomTom are automatically synchronized with dacadoo once a day. However, you can synchronize them manually with dacadoo anytime you want. 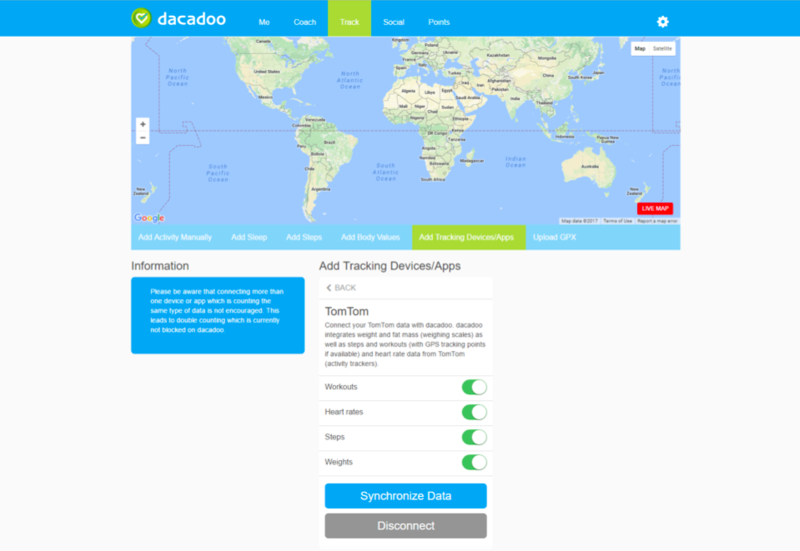 To do this, please click on Synchronize on the TomTom detail page in the dacadoo app. 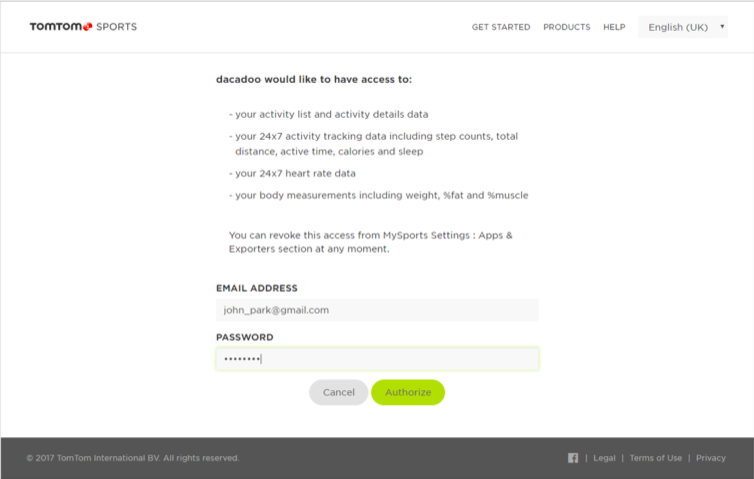 1) Login on www.dacadoo.com and click on Track in the main navigation menu. Then click on Add Tracking Devices/Apps. 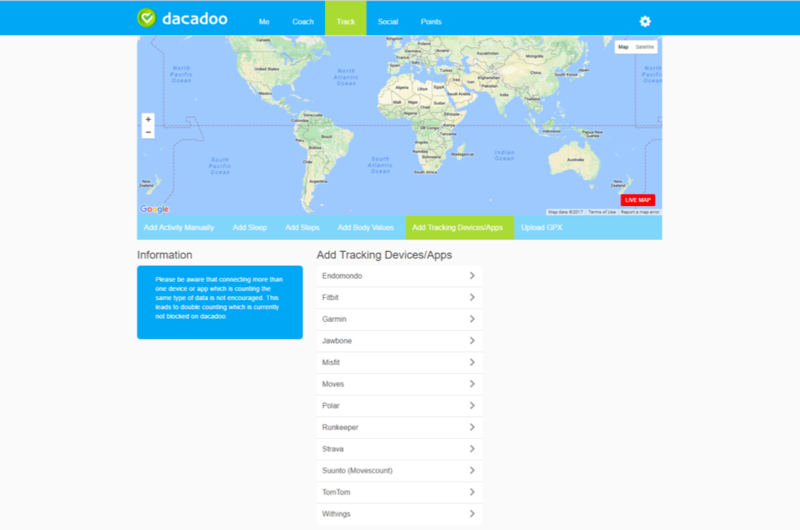 All the devices and apps that are supported by dacadoo will be displayed. 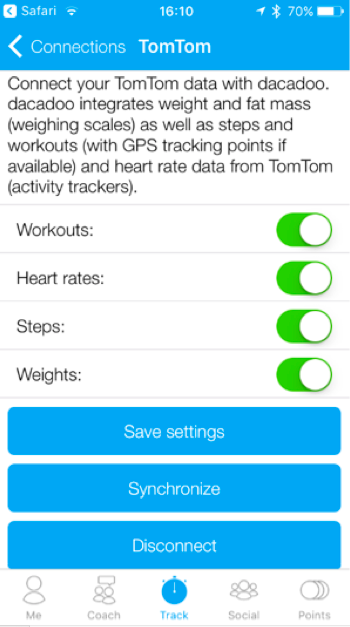 2) Select TomTom in the list of supported devices and apps. The TomTom detail page will open. Then click on Initialize Connection to start the connection process. 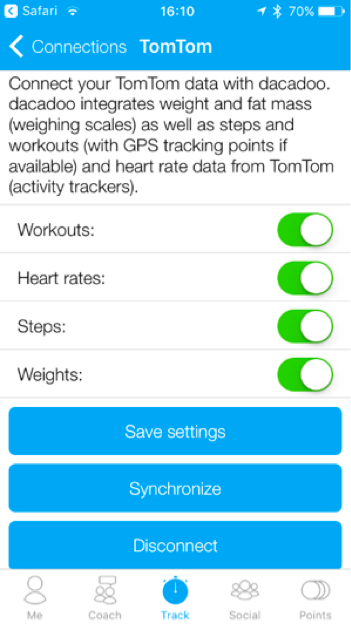 3) The TomTom authorization page will automatically open in the browser. 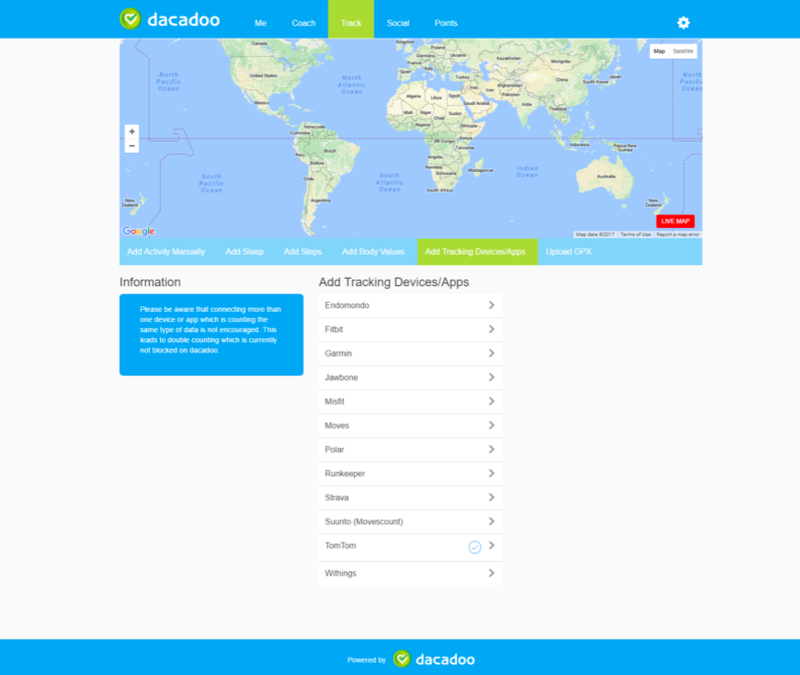 4) You will be redirected to the dacadoo app. If there is a blue tick next to TomTom, the connection with dacadoo has been established successfully. 5) To select which data you want to transfer from TomTom to dacadoo, click on TomTom, and activate the categories of interest.